Get ready for the cubesat revolution. During a talk at the Beyond the Cradle conference on March 14 from the Massachusetts Institute of Technology Media Lab, Larry James, the deputy director of NASA's Jet Propulsion Laboratory, gave the audience a sneak peak into the exciting scientific missions that NASA and JPL plan to launch in the near future and the new approaches behind some of these missions. NASA already plans to further explore Mars' atmosphere with the spacecraft MOXIE in 2020 and the outer planets with the Europa Clipper in 2023. In addition, James said, the agency and JPL are looking for ways to make exploration more cost effective and compact. Enter the cubesat. The first mission on the horizon, slated for launch in 2020, is called Lunar Flashlight. That mission will be not only the first cubesat mission to reach the moon, but also the first to use NASA’s new ammonium driven green propulsion fuel, and lasers to search for water ice on the lunar surface, James said. This cubesat will be six times the size of the small 4 inch cubed model, will shine infrared lasers into the moon's permanently shadowed craters, and an onboard spectrometer will measure surface reflection and composition to help scientists better understand the lunar surface and prepare for possible future rover missions. "We heard about the water on the moon," said James. 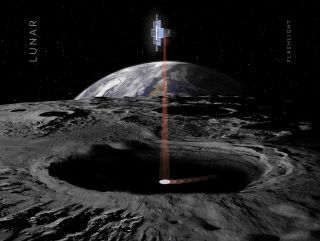 "[Lunar Flashlight] uses a laser to actually look for that water and measure what it is in those dark craters on the surface of the moon. We're using a cubesat to do that, to do real science." The second planned NASA cubesat mission, which is still in development and has yet to receive a launch date, would measure Venus' atmosphere and is called Cupid's Arrow. James said the mission is being proposed in partnership with India to launch alongside that nation's next Venus mission. Cupid's Arrow would study the noble gases of Venus' atmosphere to help scientists get a better picture of how this once Earth-like planet diverged so drastically from ours in its geophysical history. This would help future missions understand the difference between an Earth-like exoplanet and a Venus-like exoplanet. "I think there's this revolution of cubesats," said James, "that really is going to change how we can put systems into orbit that do real missions."